NOTE: You are purchasing a standalone product; MyCommunicationLab does not come packaged with this content. If you would like to purchase both the physical text and MyCommunicationLab, search for ISBN-10: 0134126890 / ISBN-13: 9780134126890. That package includes ISBN-10: 0133753824 / ISBN-13: 9780133753820 and ISBN-10: 0133882942 / ISBN-13: 9780133882940. Communication: Principles for a Lifetime was designed to address the biggest challenge when teaching Introduction to Communication: how to present the variety of fundamental theory and skills without overwhelming learners. 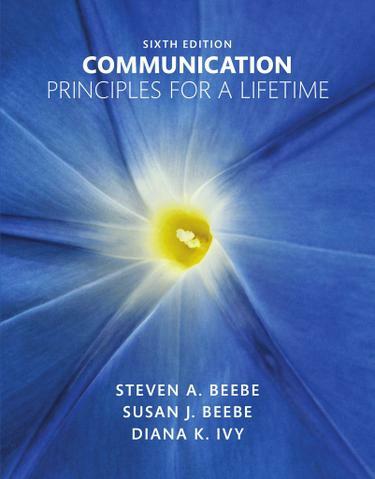 By organizing the text around five key principles of communication, authors Steven Beebe, Susan Beebe, and Diana Ivy help students to see the interplay among communication concepts, skills, and contexts. The sixth edition retains this successful five-principles framework, and adds updated content and a new learning architecture that better helps students build, and use, strong communication skills in the course and beyond. MyCommunicationLab for the Introduction to Communication course extends learning online, engaging students and improving results. Media resources with assignments bring concepts to life, and offer students opportunities to practice applying what theyve learned. And MediaShare offers an easy, mobile way for students and instructors to interact and engage with speeches, visual aids, group projects, and other files. Please note: this version of MyCommunicationLab does not include an eText. Communication: Principles for a Lifetime, Sixth Edition is also available via REVELTM, an immersive learning experience designed for the way today's students read, think, and learn.